Today, I ran across two posts–one by Spree at Wake Up America and one by Snooper at A Newt One. Both dealt with the death of Major Andrew Olmstead, a soldier and fellow blogger and both posts are directly below this one. I didn’t know Major Olmstead; I don’t think I even read his blog until I read his “Final Post”. I do know his death has touched me in more than a peripheral fashion. From his picture, I see a man with a sparkle in his eye–either a wicked sense of humor planning a perfect practical joke on someone or a fierce desire to right a wrong somewhere. I see a man who loved life and loved his country more. Had I seen him in a crowd he would have drawn my eye because he is the kind of man who would stand out, whether it be at the baseball game on a summer’s night, the football game in the fall, his child’s soccer game in the spring–or shopping at the mall with his wife. There is a certain air about him, an air of mischief and command about him, both at the same time. From his writing, I pick up he loved sci-fi, coca cola and 80’s music. Things I also enjoy. And I see from his writing his immense love for his wife and family. Yet his love for his wife and family is overshadowed by his love of country–and appears to be fully supported by his wife and family. The fact he had the foresight to design a “final post” speaks volumes about this man and his character, particularly what he wrote. Perhaps this Final Post of his is so human, so personal and so revealing, it brings home to me the quality and caliber of people we have defending us. And those we are losing. These are not people pumped out in a factory a la Star Wars “clone wars”–these are real flesh and blood people who have given their lives for this country and her freedoms and people because they felt it was the right thing to do. And I get angry at the defeatists, the leftists, the media. Angry at all those who would belittle these men and women who have chosen to serve, who have given of themselves in ways the politicians and the media, the Code Pinkos, the ANSWER crowd, the traitors never will. I get angry at the Obama’s who so glibly talk about “getting them out of Iraq”–as if men and women of this caliber want to be turned into surrenderists to serve some pandering politicians agenda. The Edwards and the Pauls and the Hillarys and all the rest who want to belittle and demean these men and women, these politicians who pander to their fringe, the politicians who call these warriors “boys and girls” instead of acknowledging these are the very people who defend the politicians rights to be total morons. I also get angry when a story such as this, in which bloggers have blogged extensively, and which was on memeorandum, is pushed off memeorandum by the usual politics crap of who said what about whom today. But that’s what happened. I have friends who currently serve; they are stateside now, but are subject to call-up at any time. I love them and respect them; I have known some of them for over twenty years. They have a special place in my heart (Fossil, you KNOW you’re one I’m talking about). I know the caliber of my friends; through them, I know the caliber of our military. They are not dumb, they aren’t stupid, many have given up well-paying careers in order to serve. Most will come home whole; some will not and some will come home in a flag draped pine box. All of them will have my love and respect, whether I know them or not. Take time out and go read Major Olmstead’s site. 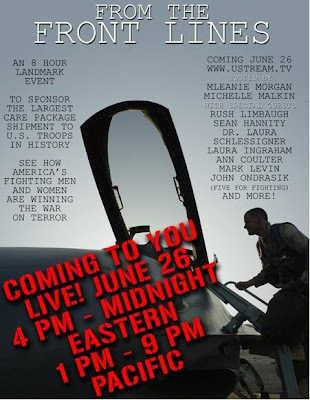 It’s a wonderful way to learn about the backbone of our military, all the other Major Olmstead’s out there who are being slandered and libeled by the traitors masquerading as MSM and left wing blogs. He chose to bring a personal touch to our military and through him, we feel a closer connection not possible in previous wars. Say a prayer for him; say a prayer for his family and the loss they now have to deal with and the hole in their family and say a prayer for each and every one of our military men and women serving to protect us and our freedoms. Stand up for them when people start badmouthing them and calling them war criminals. Get involved with groups such as Soldier’s Angels. When you see one–thank them, sincerely, for what they do for you and me. And never, ever forget who makes it possible for us to have the freedoms we have–remember, only two people have ever offered to die for YOU–Jesus Christ and the United States soldier. THIS is the kind of person you WANT to hear about. THIS is the kind of person you want your children and grandchildren to KNOW about. THIS is a HERO. First Lt. Walter Bryan Jackson. Make no mistake, the MSM doesn’t WANT the public to know of the brave men and women, those who go to extraordinary lengths to protect you, me and this country. It doesn’t fit into their agenda of complete Bush Derangement Syndrome and hammering home nothing but doom, gloom and depression. It doesn’t want children to know about men and women called to protect our freedoms and being willing to lay down their lives if necessary. It wants the public to think something as “quaint” as a hero is for the distant past, as our Founding Fathers, not something up-to-date for the hear and now, something the children can aspire to. After all, soldiers aren’t stopping global warming, they’re not rescuing polar bears or buying carbon offsets. They aren’t rebuilding neighborhoods, playing with children, engaging in laughter with businessmen, are they? Soldiers are just mindless killers, to hear it from the MSM’s point of view. But wait–soldier’s ARE rebuilding neighborhoods. They ARE playing with children. They ARE laughing with businessmen. They are educated, dedicated men and women, implacable in their desire to defend freedom. They are implacable in providing safety to the downtrodden and the terrorized. They give up the things “ordinary” men and women give up to give US–you and I–Constitutional ideals–they miss births of their own children, spend long periods of time away from their families, miss seeing their own children grow and mature. They miss holding hands with their husbands and wives, holidays, all the ordinary things we, the protected, take for granted. They do what far too many of us can’t or won’t do. And what do they get in return? They get a country full of ingrates such as the 110th Congress, Code Pink, A.N.S.W.E.R. They get ignored for their valor and their courage. The good they do is glossed over. They’re called murderers. They get spit on and disrespected at airports on US soil. They get burned in effigy. They see the flag, our incredible symbol of freedom, desecrated and defecated upon. And still, they volunteer to defend, to protect. Isn’t it about time they–at the VERY LEAST–get a “thank you”? Is that really too much to ask? Apparently, it is too much to ask–at least from the moonbat controlled fringe and MSM. 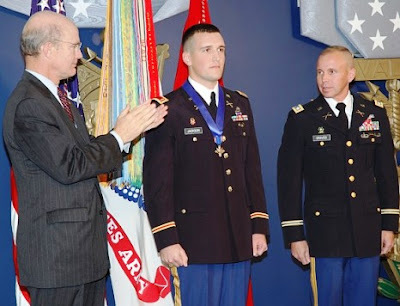 Nov. 2, 2007: First Lt. Walter B. Jackson [Oak Harbor, Washington] became the seventh Soldier since the Vietnam War ended in 1975 to receive the Distinguished Service Cross for extraordinary heroism in action. Secretary of the Army Pete Geren presented the DSC, which is second in precedence to only the Medal of Honor for valor in battle, at a ceremony held in the Pentagon’s Hall of Heroes this afternoon. Before the presentation, Lt. Col. Thomas C. Graves, former Task Force commander, recounted part of that September 2006 day when he arrived at the medical aid station to see his wounded Soldiers and the first words to come from 2nd Lt. Jackson were of concern for the wounded captain he’d rescued. 1st Lt. Jackson has been recovering from his wounds at Walter Reed Army Medical Center, having undergone more than a dozen surgeries. While recovering at WRAMC, he volunteered as an intern with the Judge Advocate General’s office. He is awaiting orders to take over a multiple launch rocket system platoon in Korea with the 2nd Infantry Division Fires Brigade. Well done. And, humbly, thank you.